As young singers fill the Medford Friends Meeting House with music on Saturday, Dec. 3, more than one tradition is being honored. Medford Quakers have been offering a holiday concert for more than a quarter-century as a holiday gift to their neighbors and friends. The children’s performance also honors the 203-year-old meetinghouse that offers singers gently aged walls as a sounding board for their music. 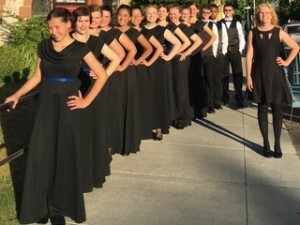 The noted choir, ChildrenSong of New Jersey, now in its 17th season and will present a free concert at 7 p.m. at Medford Friends Meeting House, located at 14 Union St., during the historic village’s Dickens Festival. According to Artistic Director Polly Murray, the concert will feature selections from Henry Purcell’s Come Ye Sons of Art, a ceremonial ode written for the Birthday Celebration of Queen Mary in 1684. Other selections include Thomas Morley’s Lirum, Lirum and Dean Rishel’s Personent Hodie written by the Philadelphia composer and commissioned by ChildrenSong. Murray also promises seasonal favorites such as Carol of the Bells and a traditional holiday sing-along. The young singers will be honored for their excellence as they travel in summer 2017 on their first European tour to Germany, Italy, Austria and Iceland, performing in the Alta Pusteria International Choral Festival, including a performance in Reykjavik before returning to New Jersey. Polly Murray founded ChildrenSong of New Jersey in 2000 as a choral music education and performance program based in Haddonfield. The program serves 75 children in four choirs between the ages of 8 and 18 from Camden, Burlington and Gloucester counties. All are welcome and no tickets are needed. The house opens at 6:30 p.m. A reception will follow the concert. The Pinelands Garden Club will again offer handmade wreaths and arrangements. Medford Friends have worshipped on the site since 1759. Meeting for Worship and First Day (Sunday) School are concurrent at 10 a.m. All are welcome. For more information call (609) 953–8914 or visit www.medfordfriendsmeeting.org.